As test examples, Hannah tagged endogenous VPS34 (class 3 phosphoinositide 3-kinase) as well as one of the downstream protein kinases it regulates, SGK3 (SGK3 (Serum/Glucocorticoid Regulated Kinase Family Member 3), with the Halo Tag. Through trial of numerous compounds elaborated by Andrea Testa and Chiara Maniaci in the Ciulli lab, an optimised probe termed HaloPROTAC–E was elaborated that consists of a high-affinity VHL binder VH298 conjugated to a chloroalkane group that links covalently to the Halo tag. HaloPROTAC–E induced reversible degradation of endogenous Halo tagged VPS34 and SGK3 with a DC50 of 3–10 nM. Degradation was relatively rapid, about 50% in 30mins (Dmax of ~95% at 48 h). Depletion of Halo–tagged SGK3 blocked downstream phosphorylation of the SGK3 substrate NDRG1. 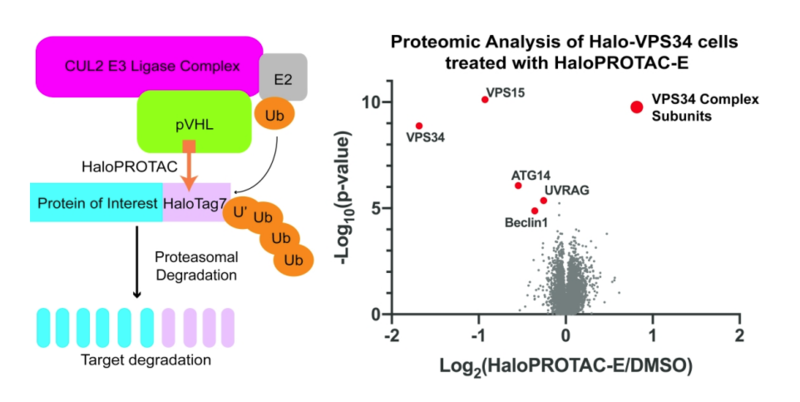 Quantitative global proteomics, undertaken by Houjiang Zhou, revealed that HaloPROTAC–E is remarkably selective, inducing only degradation of the Halo tagged endogenous VPS34 complex (VPS34, VPS15, Beclin1 and ATG14) and no other proteins were significantly degraded. Combining HaloPROTAC–E with CRISPR/Cas9 mediated endogenous protein tagging provides a useful tool to interrogate an endogenous system and validate the therapeutic potential of degrading its protein target.